In January of 2016 a group of parents, educators, and youth came together in a local school district board meeting room to discuss gender diversity issues and concerns for the youth. Later in the fall of 2016 the group launched a Family Support Group for families with gender diverse youth. 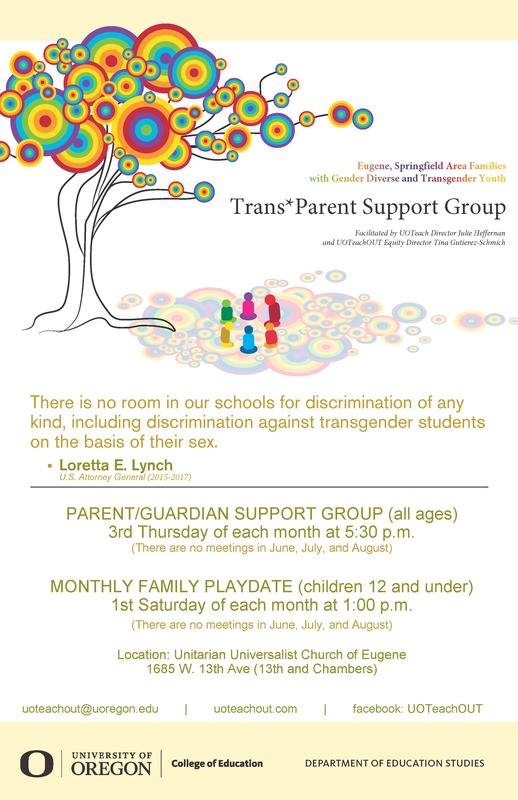 There is now a standing date for this parent and family support group for families with transgender and gender expansive children. The parent support group meets on the 3rd Thursday of each month during the school year. The early childhood family playgroup meets on the 1st Saturday of each month during the school year. There will be an information and activity table at 2018 Eugene PRIDE Celebration for UOTeachOUT: School and Community Educational Outreach and Consulting. There will be an adjacent table for the Gender Diversity Family Support Group at the Eugene Pride Celebration on Saturday, August 11th at Alton Baker Park. To help create gender sensitive and inclusive environments for all children and teens. In a simple, straightforward manner, we provide consultation, training and events designed to help families, educators, professionals, and organizations understand and address the concepts of gender identity and expression. Our accessible, practical approach is based on research and experience, enabling our clients to gain a deeper understanding of gender all along the spectrum. We present an overview of how society currently defines gender and how these restrictive definitions can be detrimental to those who do not fit neatly into these categories. We then help you identify and remove the obstacles so all are free to be their authentic selves. Leading the conversation. Shaping the media narrative. Changing the culture. That’s GLAAD at work. In 1990, a small, but dedicated group of teachers in Massachusetts came together to improve an education system that frequently allowed its lesbian, gay, bisexual and transgender (LGBT) students to be bullied, discriminated against and/or fall through the cracks. Over 25 years later, that small group has grown into the leading national education organization focused on ensuring safe schools for all students. Today, we’re known as GLSEN, the Gay, Lesbian & Straight Education Network. Mission: TransActive Gender Center provides a holistic range of services and expertise to empower transgender and gender diverse children, youth and their families in living healthy lives, free of discrimination. Education, advocacy, and support for transgender youth and their families. The Trans Youth Equality Foundation provides education, advocacy and support for transgender and gender non-conforming children and youth and their families. Our mission is to share information about the unique needs of this community, partnering with families, educators and service providers to help foster a healthy, caring, and safe environment for all transgender children. Mission: TYFA empowers children and families by partnering with educators, service providers and communities, to develop supportive environments in which gender may be expressed and respected. Creating Safe and Welcoming Schools For All Children & Families. HRC Welcoming Schools is a comprehensive approach to creating respectful and supportive elementary schools with resources and professional development to embrace family diversity, create LGBTQ-inclusive schools, prevent bias-based bullying and gender stereotyping, and support transgender and gender-expansive students. TRANSATHLETE.com is a resource for students, athletes, coaches, and administrators to find information about trans inclusion in athletics at various levels of play. This site pulls together existing information in one central location, and breaks down information into easy-to-reference areas to help you find what you need.